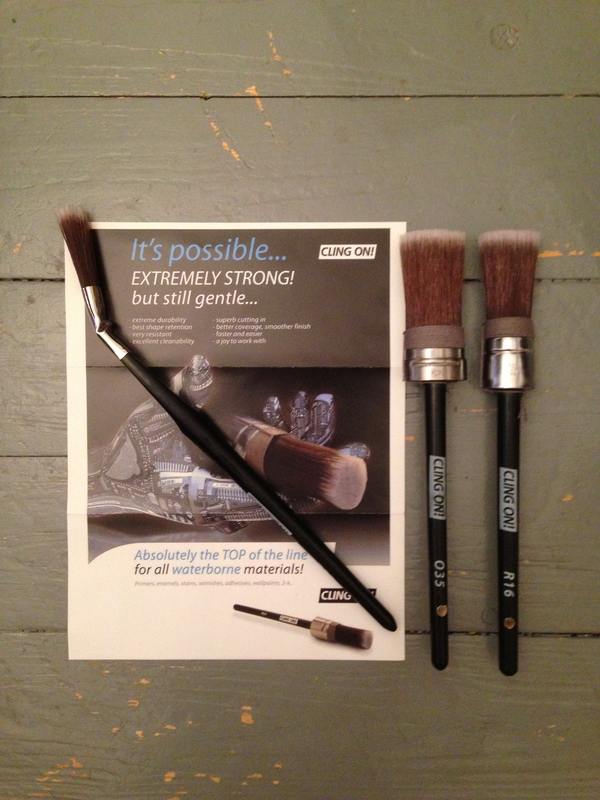 This week I have received three brushes from CLING ON! 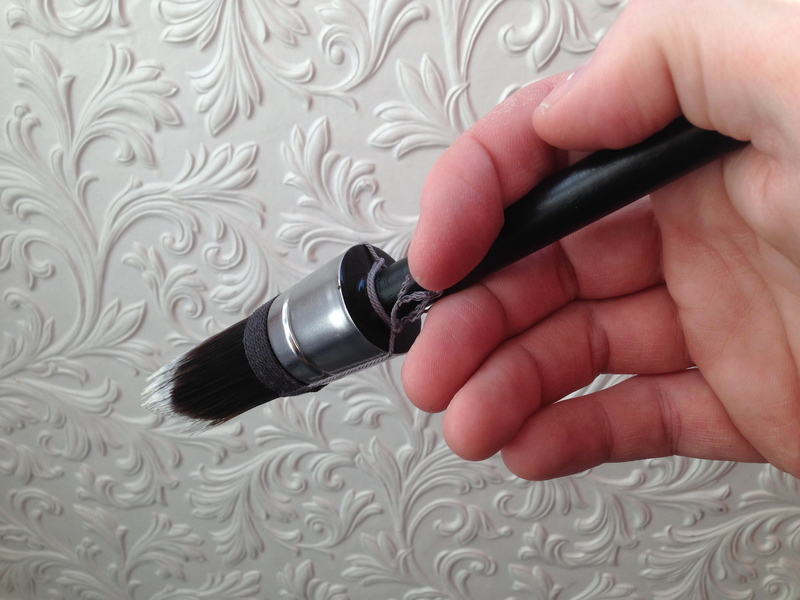 – a Dutch brush manufacturer – for trial and feedback. 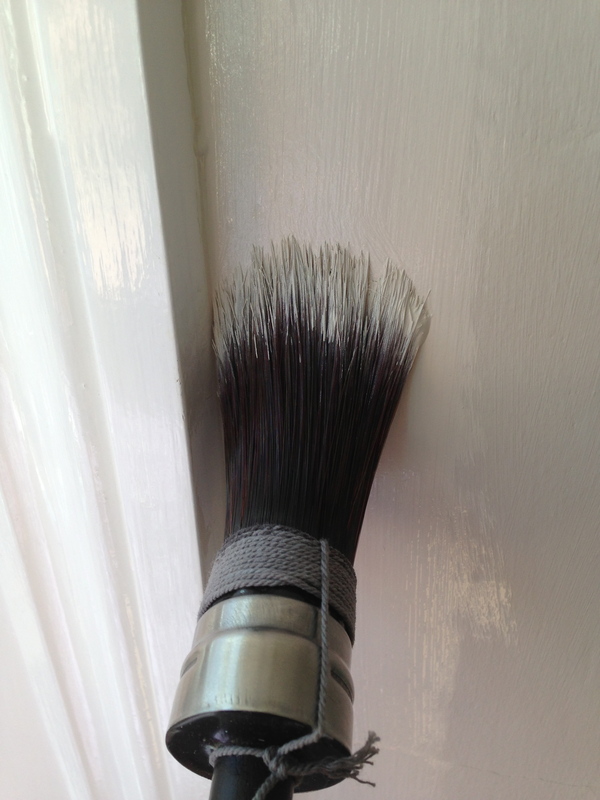 The R16 a round section sash brush, *O35 an oval section sash brush and a P20 which is similar to an angled radiator style brush. 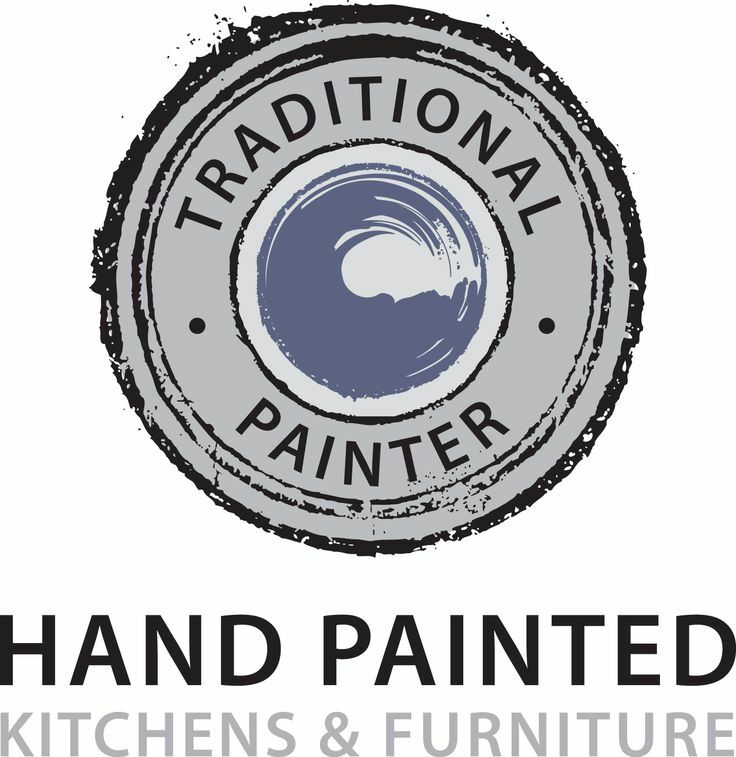 The build is wooden painted handles. R16 and O35 have holes drilled so that they can be hung; there is a breakthrough problem with the drilling, which means that the holes aren’t cleanly drilled; splintering. Both R16 and O35 are strung around the base of the filaments to aid rigidity and shape. Unlike the usual sash brushes that I am aware of, the trim of the filament is 90 degrees straight across the top of the brush (flat top, not tapered). My observations are; the ferrules (R16 and o35) are not sited well onto the wooden handle leaving exposed and sharp metal exactly where your fingers are going to fall… rendering prolonged use “painful”. 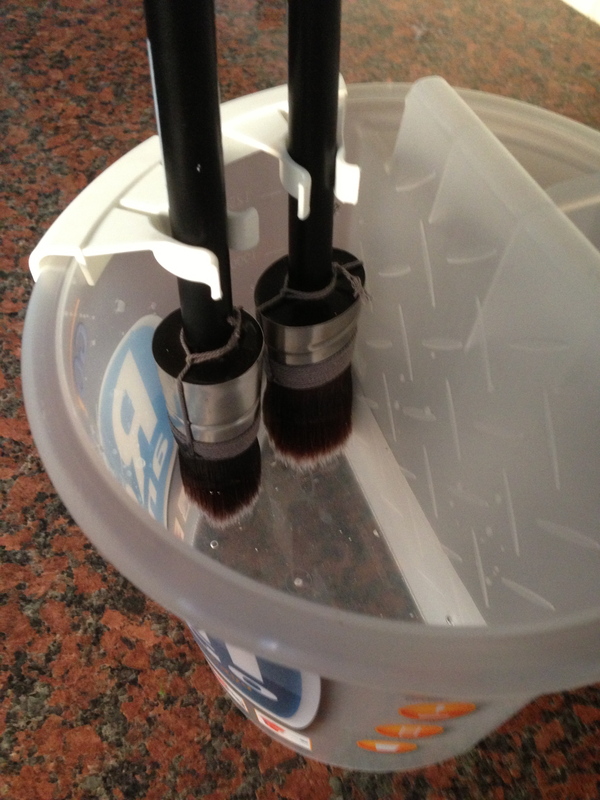 Following further information from the manufacturer, I prepared the brushes by soaking them in water to make the filaments more flexible, pictured above in the Roll and Go! paint system with brush clips, I was told to hang the brushes rather than allowing them to rest at the bottom of the kettle. I have only tested R16 and O35; I’m really unsure how P20 works, in honesty. OK, so on to painting; I used Little Green Paint Company Ultimatt with ZAMIX conditioner – these brushes are only intended for waterborne paints – as you can see from the above picture, there is a slight splaying problem and I didn’t notice a “teardrop” from the filament. However, the cut that I achieved was pretty good and the finish was also respectable. The balance of R16 was also unexpectedly good, however I did need to alter my “grip” to find a comfortable hold position – being such a thin handle, which is painted takes a little while to get used to. Verdict; did I love the R16 and *O35, no… did I like them, yes; quite quirky and if the price point is right and their marketing department gets the usage message across, I can see that there will be a market for these brushes. Probably not high end professional but for a competent DIY’er, I look forward to seeing them on the shelves here in the UK. 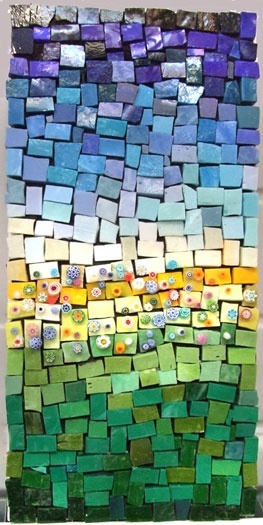 This entry was posted in Uncategorized on March 2, 2013 by mjguestltdblog.